Sleeping in late, traveling as you please, no more performance reviews... what's not to love about the idea of retirement? For most people, retirement is the ultimate goal, but you're not alone if you don't know how, if, or when you'll be able to retire. Saving money to support your family through retirement can seem daunting, but as we always say, anything can be achieved if you make a plan! While everyone's retirement goal is different, let's assume your goal is to have $1 million dollars saved for retirement. Sounds great, right? It's an easy, round number to plan for and should be enough to support most people in their retirement years. Talk to your financial adviser about your specific goals, but for the sake of generality, let's assume your goal is to save $1 million. 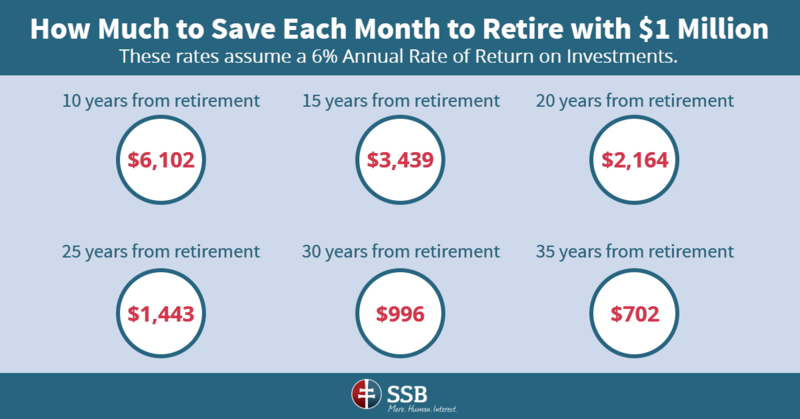 Let's also assume that you have $0 saved right now, and that you're able to achieve a 6% annual rate of return on your retirement investments. Based on those assumptions, here's how much you need to save each month in order to retire with $1 million. Don't be intimidated if those numbers seem large! You're not out of luck if you can't put away quite that much each month. In fact, you can calculate your own million-dollar retirement plan using this calculator. The moral of the story is: save early and often. There's no magic number for retirement, but the more you have saved, the more comfortable you will be. Take advantage of your company's 401k match. If your employer matches a certain percentage of your 401k contributions, do not pass up this free money. We repeat: free money! Your take-home pay may be smaller, but you'll be doubling your retirement savings. Not sure if this is available to you, or how to get it? Talk to your HR or your payroll specialist. Any unexpected money - birthday checks, income tax refunds, a bonus - should go into your savings. If you don't need it right away, it's better off growing and accumulating interest. Use SSB's mobile app to deposit your check right away! Just snap a picture and the money will go into your bank account. Whether this comes in the form of a raise, a promotion, a part-time job or a side hustle, additional income will make saving faster and easier. Here are some low-commitment ways to make more money: rent your spare bedroom on Airbnb, walk dogs or pet sit, sell your skills on Fiverr, drive for Uber or Lyft, or help others get things done with TaskRabbit. Always do your research before committing to any of these programs, but the options are out there. Your daily life can trigger you to save money. Here are five more ways to save more money on a daily basis! We're happy to help you save for retirement, and earn interest on your savings. Stop in or contact us online to talk about securing your financial future!